In 2008, Lukasz Gadowski – who almost everyone in the German Web startup scene knows because he built or helped build some of Europe's biggest Internet success stories, e.g. Spreadshirt, studiVZ and brands4friends – and Kolja Hebenstreit teamed up with Pawel Chudzinski and Steffen Hoellinger to create Team Europe Ventures (TEV). TEV had two purposes: Building companies and investing in other Internet startups. Since then, TEV has founded a number of highly successful Internet companies – DeliveryHero, DigitaleSeiten, ChicChickClub, madvertise and SponsorPay, to name just a few. In 2009 TEV raised a ~ €6M fund, which was managed by Pawel and invested in 24 companies. 16 out of these 24 companies were co-investments with myself, some led by Pawel, some by me, some by both of us together. So as you can see, although we didn't formally set up a partnership until recently, we've worked together very closely in the last few years. 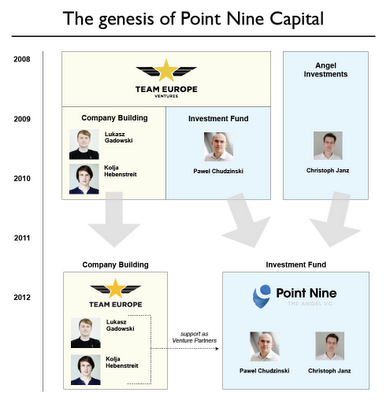 In 2011 we concluded that it's time to take our collaboration to the next level and Lukasz, Kolja, Pawel and I decided to create an independent investment firm called Point Nine Capital. In connection with this, the existing TEV fund has been renamed into Point Nine Capital Fund I. 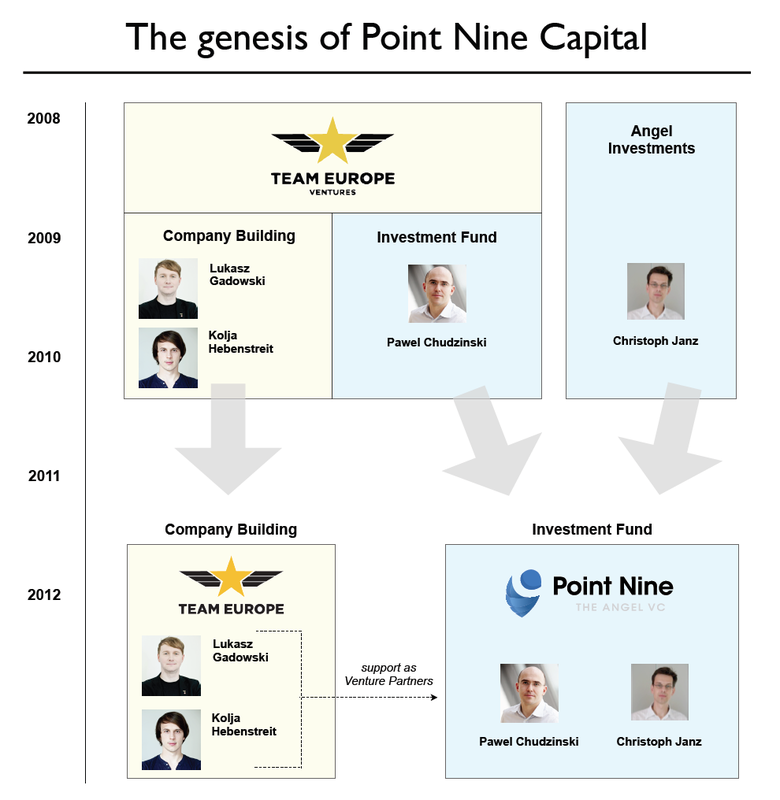 The new fund, called Point Nine Capital II, is now managed by Pawel and me, and we're also the biggest stakeholders. Lukasz and Kolja continue to run Team Europe, which is now exclusively focused on creating fast-growing Internet companies, and they also support us as Venture Partners. Point Nine Capital II has made four investments already – one is a great Canadian SaaS startup called Jobber, the rest hasn't been announced yet – and we're looking forward to making many more investments in the coming months and years. Our focus continues to be on SaaS, marketplaces, lead generation, eCommerce and mobile. Additional information is available on our website, and if you have any questions, feel free to ask! We offer a three month paid internship, starting middle of April or beginning of May at our office in Berlin. Support evaluating the dealflow; give us your opinion on >100 business ideas and plans per month; find the one we should invest in. Do networking; meet people and founders. Screen new markets; find hidden champions; be faster than the rest. Dig deep into topics; help with research; find answers for questions we have not asked yet. Help us run operations more efficiently. Insights how a venture capital firm works. Steep learning curve; small team; much responsibility if you can earn it. Access to our network: our portfolio companies as well as Team Europe (Company Building), iPotentials (HR), Gruenderszene & Venture Village (media). Berlin, the upcoming heart of the European StartUp industry. That is where you meet all the founders, evangelists, angels and influencers. Enough time to enjoy life. You are a digital native; you used facebook, before people heard about studiVZ; you check in with foursquare and take photos with instagram; maybe you even blog and twitter. You are familiar with basics of the Internet infrastructure and have some understanding of key Internet based business models, like e-commerce, large networks, SaaS, etc. You are curious; you have your own ideas; you want to see results. We do not need to tell you what you have to do. You see the tasks, you do them, you surprise us. You don’t need 9 to 5 working hours. And the usual stuff: you have at least 4 semesters at your business school, preferable already a first degree. You have gained international experience, have done at least one internship before. You speak fluent English and hopefully German. In the last few years I've seen a lot of financial plans, and since we started Point Nine in the middle of last year that volume has been skyrocketing. I've seen everything from just a few numbers in an email to extremely sophisticated Excel spreadsheets with dozens of tabs and tens of thousands of cells, and I thought I'd offer some advice on what I think a good financial plan looks like. To begin with, among the worst financial plans are those that you get if you take a template from a business plan competition or a bank in Germany and don't customize it to your particular business. These templates are usually very detailed on the costs side, listing everything from magazine subscriptions to stationary and postage, but the revenue projection is just one line – a pure estimate that is coming out of nowhere. Parkinson's Law of Triviality comes to mind! If anyone is interested in further details, please let me know in the comments section, email me or send me a tweet and I can add some more color and post an example.